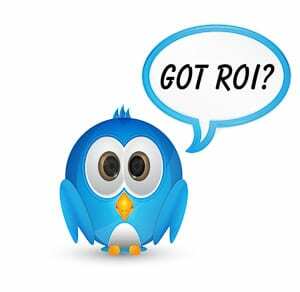 The Twitter bird wants to know: How do you calculate social media ROI for your business? It’s not always easy to measure the ROI of social media marketing campaigns as a hard and fast number. But with help from the resources I’ve collected below, you’ll be able to set social media effectiveness goals and report on your marketing results with confidence. Measuring social media effectiveness in marketing can be tricky. Even so, marketing teams who run the best social media campaigns include specific goals and social media ROI metrics to help guide and refine their social tactics. They use social media measurement tools, social ROI calculators, templates, and other resources to help gauge the ROI of social media campaigns and improve social media effectiveness. I regularly work with Google Analytics to measure digital marketing effectiveness. So, I was curious to see what other experts were thinking and writing in the area of social media ROI measurement. My goal with this ‘article roundup’ post is to collect and summarize a good list of articles on the topic of social media measurement, all in one handy resource. I plan to update this post periodically so it can serve as an evergreen resource for future reference as well. What follows is some of the best material I found online. I hope it helps you build and measure effective social media marketing campaigns. 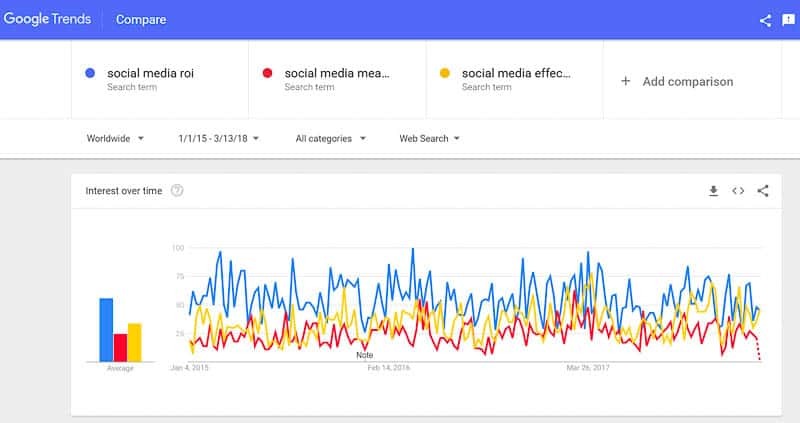 There’s been pretty consistent search interest in social media ROI, social media measurement, and social media effectiveness terms over the last few years. It’s an indication that many people are still trying to figure this stuff out and are hungry for more insights. 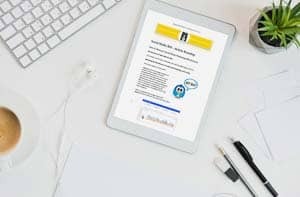 BONUS: Save this article as a handy PDF to get additional bonus material on social media ROI measurement tools and related resources. Free Bonus: Full article PDF with bonus sections on social media ROI tools and related resources. To help organize this content, I’ve grouped the articles into three categories below. Some of the articles cover the topic of social media ROI and effectiveness in a more conceptual way. Others provide more hard-hitting social media ROI definitions and examples. They may describe how to measure social media ROI with specific social media measurement tools. For example, some show how to measure social media with Google Analytics. A few articles either include or point to brief social media ROI case studies. I end the list with a couple of pointers to classes on measuring the benefits of social media marketing. So whatever your needs may be, there’s a good chance that at least some of the articles below will help teach you how to measure social media effectiveness and improve social ROI for your organization. The basic ROI equation is: ROI = [(Benefit – Cost) / Cost] * 100%. (This is true for any financial ROI measure, not just social media marketing). Expressed as a percentage, financial ROI is basically what you gain (Benefit – Cost) vs. the Cost required to realize that incremental gain. The key, as in most financial analyses, is to focus on *incremental* benefits measured against the *incremental* costs to achieve them. So in practice, it’s very possible to build a social ROI calculator using a spreadsheet as the overall social media measurement tool that captures all costs and benefits. Companies can build and customize their own social media ROI template and use it across multiple marketing campaigns. Of course, they can also use social measurement tools and templates provided by specific 3rd-party software platforms. Hard ROI is measured in real percentages based on real currency units (US dollars, Euros, etc.). If the ROI is positive, you can translate it into cash, pay bills with it, etc. It is real, tangible financial return. Soft ROI, on the other hand, is not directly or accurately quantifiable in financial terms. You can’t pay the office rent, staff salaries, or utility bills with soft ROI. However, note that soft ROI may, in fact, ultimately lead to hard ROI. The connection may just be very fuzzy. In the world of social media marketing (and even marketing more generally), the concept of soft ROI comes up constantly since some marketing initiatives are inherently more difficult to quantify directly in terms of incremental financial benefits. This concept shows up in a few of the articles collected below. Seems like a smart approach to me, too. The world of social media marketing is full of software tools designed to help manage social marketing processes and measure social media effectiveness. Social media measurement often starts with Google Analytics and can be augmented with management tools from vendors such as Buffer, HootSuite, and others. Setting goals, defining proper social media metrics that tie to these goals, measurement and analysis, reporting, and adjustment. It’s a closed-loop cycle that is designed to continuously measure and improve social media marketing over time. So with the intro and context provided above, let’s dive in to the actual articles. The articles I’ve summarized below come from several different sources. Some are from social media platform vendors who obviously want marketers to receive value (‘ROI’ in various forms) from their engagement in social media marketing activities. Others are from presumably more neutral sources… social media practitioners and experts, etc. 1. We’ll start the list with this painfully funny and on-point cartoon about social media ROI, from Marketing Week and Marketoonist. That point above about hard ROI vs. soft ROI? It’s well captured in this cartoon. You just can’t pay the bills with social media vanity metrics such as Facebook likes and Twitter retweets. 2. Gary Vaynerchuk offers a funny piece on social media ROI in this short piece. You won’t get analytical tips or quantitative steps here, just interesting and humorous parallels about skill, time, execution, commitment, and other parts of the ‘investment’ variable. This article is a couple of years old now but is still worth a quick read. 3. A brief article by Tereza Litsa that introduces the challenges of measurement in social media. She discusses different approaches for brand awareness, increasing engagement, and lead generation. Not heavy on social media effectiveness examples or social ROI math, but more of a general overview and discussion piece. Does include a link at the end to several free tools for measuring social media marketing ROI. 4. From Gretchen Fox of MTO Agency, a brief and very pro-social-marketing article on busting social media ROI myths. Includes links to several supporting articles, data points, and related resources. Not an ROI-specific tutorial, but rather a plea for businesses to wake up and get on board the social train. Includes a 5-point explanation for why companies avoid leveraging social media marketing. 5. Robert Allen provides this interesting discussion about the perceptions of social media marketing effectiveness in B2B and B2C markets. He covers a range of social media goals, from brand awareness and customer engagement to lead generation and customer acquisition. Includes several charts and graphs that show survey results covering all the major social platforms, including perceptions of ROI. 6. From David Moth of Econsultancy, this article includes discussion of social media case studies. 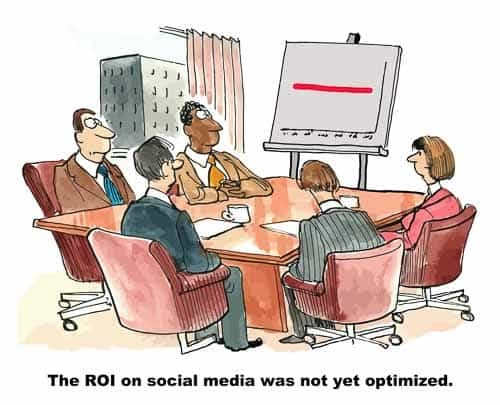 However, it starts with the observation that measuring social media ROI is still tough, especially for B2B marketers. It references an earlier article that suggests many marketers should stop investing in (organic) social media marketing, diverting those resources instead to channels that are more highly measurable with a direct cause-effect relationship (including *paid* social). Includes pointers to helpful guides from HootSuite and Buffer. Also includes summaries and links to a few social media case studies depicting social media effectiveness, including BT, KLM, Made.com, Incontact, and IBM. 7. This is a fairly short article by Ronald Dod on calculating social media ROI and some of the pitfalls the author has had trying to produce social ROI metrics for his clients. The article points out some of the measurement challenges that can crop up within Google Analytics and Facebook metrics, plus the challenges of proper attribution back to social media activity. 8. The next article by Sagi Solomon on the Advanced Web Ranking blog is focused on how to measure social media ROI. It offers a 3-step approach based on 1) establishing S.M.A.R.T. social media goals, 2) tracking and reporting progress, and 3) quantifying results where possible. It’s a pretty quick and worthwhile read, especially as a reminder to set realistic and measurable goals. The article references Google Analytics and various social media dashboard tools. 9. Marisa Fiore provided an article on Tracx focused on proving the value of your social media based on the now-familiar approach of setting goals and objectives, tracking results, assigning monetary amounts to benefits and costs, then running the standard ROI calculation: ROI (%) = [(Benefits – Costs)/Costs]*100%. The devil is in the details of these steps, of course. But they offer a free social media ROI template (note: gated content) to help people out with the implementation. Looks to me like it could be a pretty useful tool. 10. From Patrick Whatman at URL shortening service Bitly, we have this piece on proving that social ROI is not a mythical beast. It’s a quality article that covers the essential whys and hows of calculating social media ROI, including brief bits on tools such as Google Analytics, Kissmetrics, Bitly (of course), and Mention. Patrick’s focus is on setting specific social media goals, tracking the right metrics, and doing as much source attribution as possible for various goal conversions. 11. Here’s a good article by Scott Desgrosseillers of Wicked Reports. It’s based on a real-world social media marketing case study with GetMaineLobster and its attempts to tie social media efforts and investments to actual revenue. He discusses obstacles to measuring social ROI, crucial social media metrics to monitor, various attribution models, and holding social media marketing managers accountable for real results. Neil concludes that the key to being a good marketer is testing. 14. From Sapir Segal of social media management vendor Oktopost, this article describes how to quantify social media ROI, what items to measure, understanding goals and setting social media KPIs, proving and *improving* social ROI. 15. This article by Breonna Bergstrom of social media solution vendor CoSchedule focuses on organic social media ROI… vs. the paid stuff. Includes a helpful walk-through of setting goals and custom reports in Google Analytics, and building custom URL tags (i.e., UTM link tagging for social campaign tracking). Then, of course, reporting and analysis of campaign results… including a brief intro of how CoSchedule can help make your life easier as a social media marketer. The article also includes an offer for a free social media ROI template. It also mentions the ‘on-platform’ analytics that the social platforms provide: Facebook Insights, Pinterest Analytics, Twitter Analytics, YouTube Analytics, and Instagram Analytics. This article has a good comment stream and social sharing, as is common with content on Social Media Examiner. The article is a bit older now (2014) than most of the others in this roundup. But it still provides lots of links to helpful related info and free tools for measuring social media effectiveness. 19. This piece from Kevan Lee at Buffer is billed as a ‘Delightfully Short Guide’ to social media ROI, and it serves that purpose well. This article concludes by embedding the detailed infographic from Neil Patel at QuickSprout (mentioned above). It also provides helpful related links for further tips on how to measure social media effectiveness and ROI. 20. Dominique Jackson provides a good article that describes the challenges associated with measuring social media and then provides a quick walk-through of some of the setup required in Google Analytics to support the effort. It includes useful related links, including resources for calculating ‘customer lifetime value’ (customer LTV). 21. By Sarah Dawley from social media juggernaut HootSuite, this is a good and pragmatic discussion of the overall social media measurement process. Includes references to several HootSuite tools that can help along the way, as well as Google Analytics and Facebook Pixels tools. This is a fee-based Udemy class on calculating social media ROI, with Google Analytics (GA) as part of the solution. For example, using GA Goals to allow conversion tracking based on social marketing activities. The course includes video instruction (lecture format) and supplemental resources. Course fee is $13 (71% discount) as of early March 2018. 4.4 stars based on 28 ratings. First launched in 2015 by instructor Ali Mirza. Last course update was June 2017. English language. This page includes student reviews as well as links to similar courses. This material uses Google Analytics data as well as platform-specific metrics from Twitter, Facebook, Instagram, and LinkedIn. So that’s it… almost two dozen good articles and online courses that can help us all become better social media marketers, with social ROI calculations to back up and help improve our efforts. I plan to update this post periodically with fresh finds and will send those updates to my email subscribers so they won’t need to remember to check back here. Grab the bonus offer above (yellow box) and you’ll automatically be on my list for further updates. I welcome your feedback and comments below. Which of the above articles were most helpful for you? Any important concepts missing? Thanks for reading, commenting, and sharing with your social networks below, too. Epic post, David! Love all the resources. Subscribe me to iBeam Marketing Consulting's email list. Copyright © 2019 iBeam Marketing Consulting Services, LLC. All rights reserved.